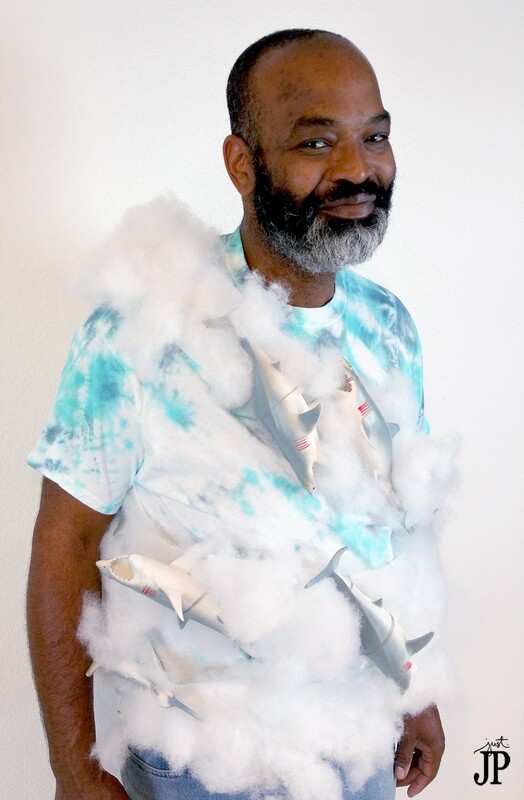 This costume is all about YOU being the actual Sharknado – which is a tornado with sharks in it because, well, that makes total sense, right? To make this costume girly, we added a white tutu. For guy, just wear the shirt with jeans. Because I love a costume that is more than a costume, we decided to make a felt sash that the polyfill and sharks are attached to. The sash wraps around the tie dye shirt and can be removed for washing or to wear the shirt as a shirt after Halloween is over. I decided to order really big sharks online from Amazon. It's a bonus that these one squeak like rubber ducks! 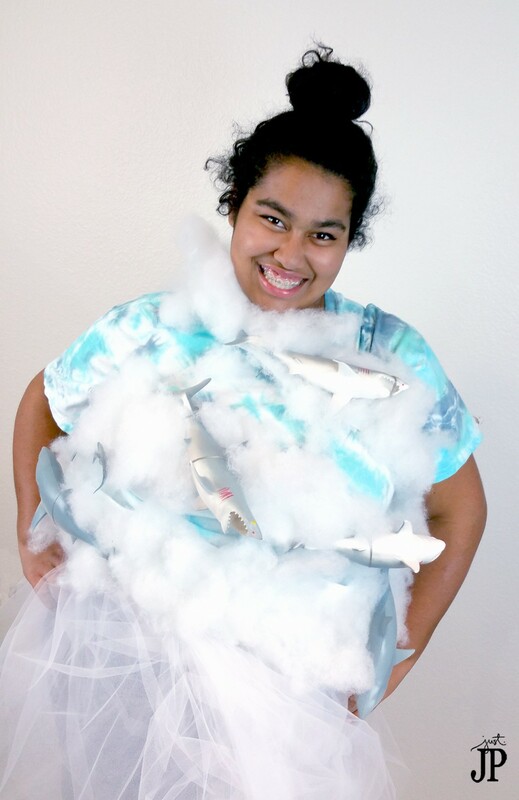 The award for “most annoying costume ever” goes to… I included a link to the sharks down at the bottom of this post so you can order them too. Everyone needs a dozen squeaky sharks in their life. To make this costume guy friendly, just pair it with jeans instead of a tutu. I know, it's kinda crazy easy. 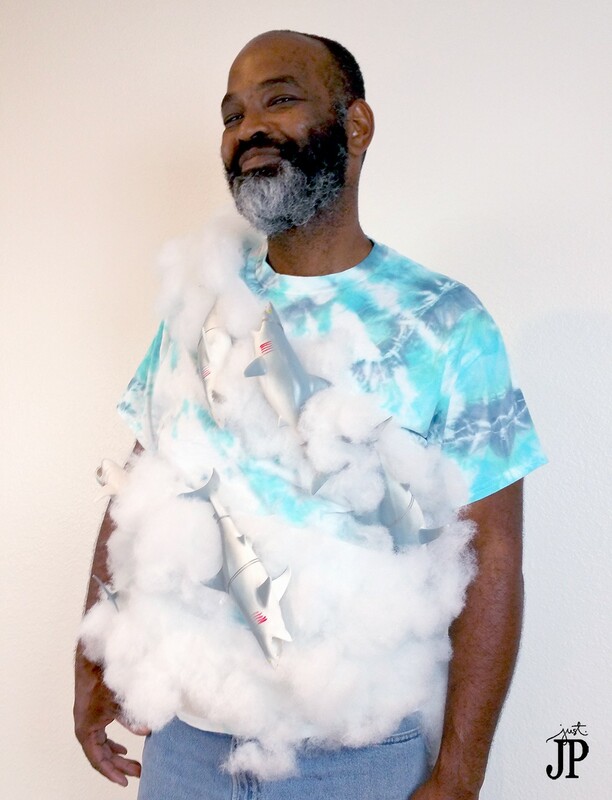 You could make two of these and goes as his and hers Sharknado costumes! 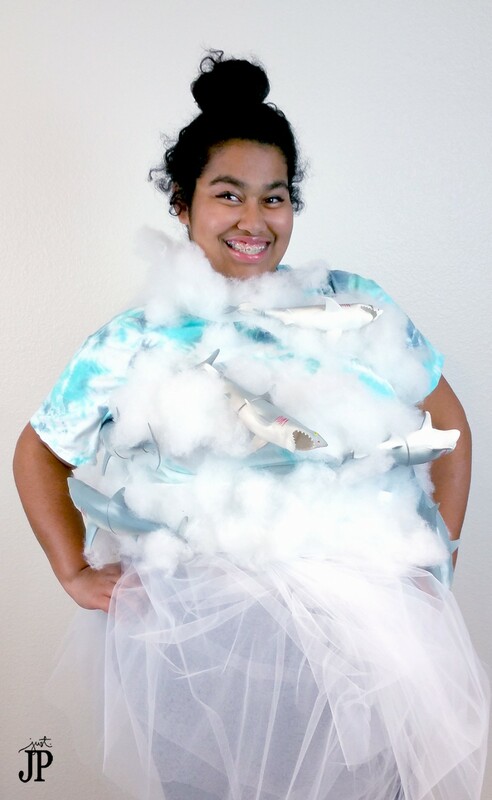 This tutorial video shows how to make the Sharknado costume, including the tutu. It's pretty simple! Wet a white t-shirt with water. Add water to each bottle of Tulip One-Step Tie Dye in the following colors: Blue, Turquoise, and Grey. Mix thoroughly. Flatten the T-shirt on a table. Roll the shirt into a tube diagonally, starting from the bottom right and rolling to the upper left of the shirt. Twist the tube into a cinnamon roll shape and secure with rubber bands (in the Tulip One-Step Tie Dye Kit). Dye each section of the “cinnamon roll” a different color. Wrap in plastic and allow to set for 6-8 hours. Rinse the excess dye from the shirt with cool water, removing the bands. Wash in the washing machine by itself. Dry. Cut two 4″ x 48″ strips of white felt. Stitch the strips together at the end to form one long strip. Using Aleene's No-Sew glue, adhere polyfill tohe sahs. Use a weight to hold down the polyfill in the glue while drying. One the strip is covered with polyfill, hand sew sharks to the strip using embroidery floss. Fold 7 yards of tulle into a 1 yard stack. Pin together. Wrap a piece of elastic around your waist, stretch slightly as comfortable. Cut tolength, with a 2″ overhang. Stretching the elastic as you sew, stitch the tulle to the elastic with a sewing machine. Sew the ends of the elastic together to close off the tutu. 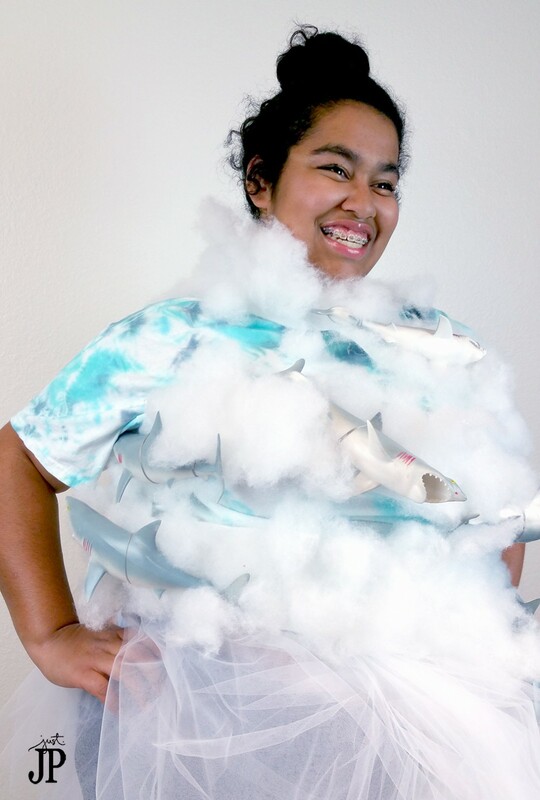 Put the shirt on and then wrap the shark sash around your body, securing it in place with safety pins. Guys, wear jeans with this and girls, wear the tutu! 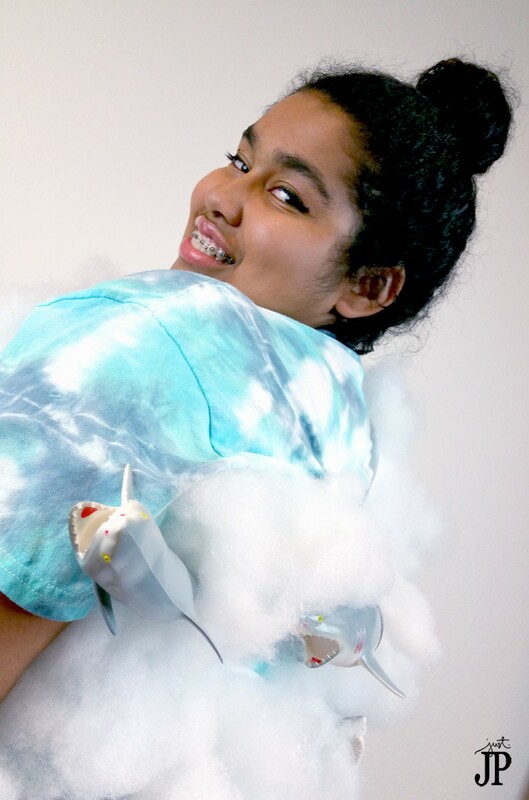 be sure to put sharks on the back of the sash too for the full Sharknado experience from every angle. 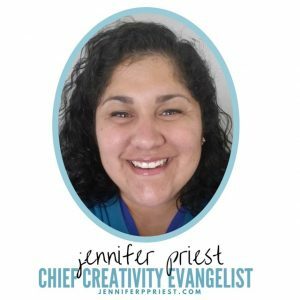 A huge thank you to these 30 Days of Halloween sponsors for this post!